The Burlington Canal Lift Bridge is the icon of the Industrial Revolution that took place in Canada in the 19th century. I have therefore chosen it to represent the theme Industrial for this week’s A Word A Week Photo Challenge in response to Skinnywench (aka Sue). Built in 1826 with the opening of the Burlington Canal, which links the waters of Hamilton Harbour (also known as Burlington Bay) to Lake Erie and Lake Ontario to the Atlantic Ocean, the lift bridge is a tower-driven, moveable and vertically lifted bridge. It raises on demand to big vessels year round and hourly or half-hourly to smaller boats or pleasure vessels in the summer. According to government statistics, the bridge is 116 metres long, weighs 1996 tonnes and lifts 33.5 metres high as in the photo above. 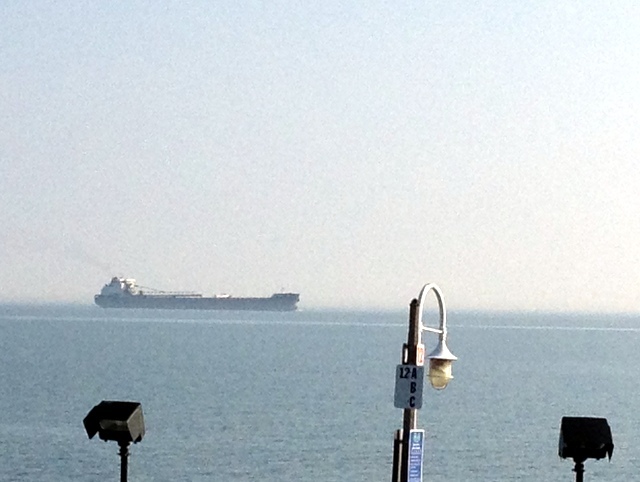 Seen from the picture, the height is similar to the Skyway Bridge (36 metres high) behind it. The Lift Bridge provides two-lane traffic for vehicles and a side-walk for pedestrians and cyclist. Personally, I walk across the Lift Bridge regularly in the summer, because it is on my training route along the Burlington Waterfront Trail and Hamilton Beach Trail. The Lift Bridge is also part of the route of the Around the Bay Road Race, which has been taking place at the end of March since 1894, three years earlier than the Boston’s inaugural race. On race day, the Lift Bridge is closed entirely to traffic. I love bridges and I have taken part in the race of the reason that I want to walk on the steel surface of the bridge thinking that I have history under my feet. The photos below were taken on a cloudier day. The vessel is typical of those that requires the lift bridge to raise. When this happens, a horn will sound, and the traffic has to stop. Pedestrians and cyclists also wait behind the gate. The entire operation takes about four to five minutes. One may question the efficiency and the utility of this lift bridge now that there is the Skyway Bridge providing through road traffic across the Burlington Canal. I think the Lift Bridge remains more for its historical significance than for its functionality. 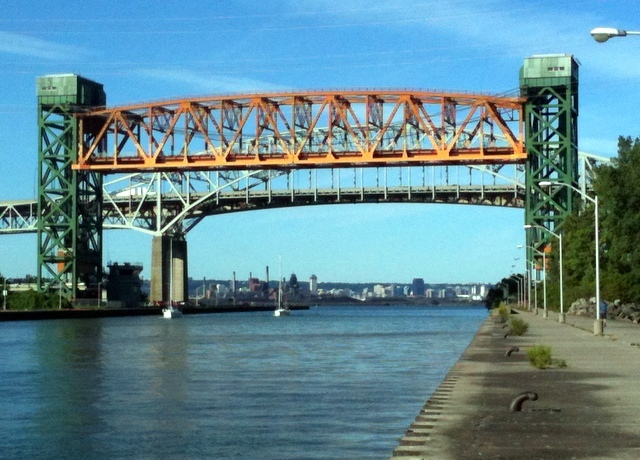 The City of Hamilton has thrived as an industrial city (Canada’s Steel Town) during the Industrial Revolution and the waterway is an important link between North American and Europe in international trade and commerce. One can imagine how differently the steam ocean vessels would look crossing the Atlantic Ocean and coming to dock in Hamilton 180 years ago. An average journey in those days took six to twelve days. Raw material aside, they also brought immigrants who helped shaped the landscape of Canada. The Lift Bridge has witnessed the growth and decline of the steel industry in this part of the world. It deservedly stands for “Industrial”. 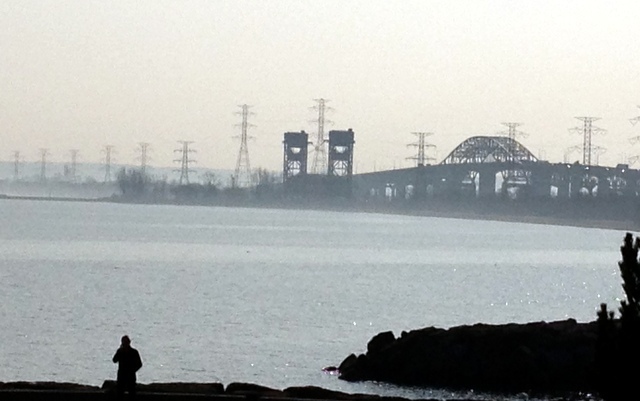 This entry was posted in History, Travels and tagged A Word A Week Photo Challenge: Industrial, Around the Bay Road Race, Burlington Bay, Burlington Canal Lift Bridge, Hamilton Harbour, Industrial Revolution in Canada on February 20, 2013 by Opalla.